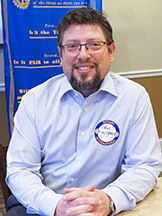 Rotary File of January 15, 2019 | Rotary Club of Iowa City A.M.
Casey Cook was able to join today. Kate announced that trivia had 175 participants and raised approximately $2,000. Jack Cameron announced that the Christmas Wrapping brought in 962.00. Chris announced that PDG Diana Reed passed away last week. Visitation will be held Thursday, 4-7 in West Des Moines. Deb Dunkhase will be retiring from the Children's Museum after 21 years of service. The can sorting fundraiser, has brought in $8,000 since July. Ann Romanowski announced that on Thursday February 21 the club will celebrate its 30th anniversary with a dinner at the Kirkwood Room. More details to follow. In November, 2017 a new can and plastic deposit system was added. The UK, India, and Australia and working to improve their systems. 2019 is the 40th anniversary of the Bottle. Some proposals in Oregon are increase handling fee from 1cent to higher, increase to non carbonated drinks, increase redemption toe 10 cents, move away retail. For more information contact: troyw@can shed.com.